Don Erickson, site director for Lockheed Martin Aeronautics Greenville, will present at this year’s South Carolina Aerospace Conference and Expo on August 30, 2017. Erickson will discuss Lockheed’s decision to move F-16 production from Fort Worth to Greenville. The move was announced in March and is expected to bring 250 new jobs to the facility in two years. As site director, Erickson is responsible for all activities associated with aircraft modification, maintenance, repair, overhaul (MMRO), final assembly services, and company management system (CMS) compliance. Erickson also serves on SC Aerospace’s Advisory Board. There are a number of small parts made of high-tech materials that have gone to the moon, to Mars, in Olympic bobsleds and NASCAR race cars, across the sky in commercial jets and in a White House Christmas ornament, that have one thing in common. They were made right here in South Carolina by Phoenix Specialty Manufacturing. On March 23, Phoenix celebrated its 110th year in business and 50th year in Bamberg, S.C. Started in New York in 1907, Phoenix moved its operations to South Carolina in 1967 to fulfill a promise made by founder Robert Hurst, Sr., to help boost his friend Franklin Rizer “Ziggy” Hartzog’s political credentials. Since then, the plant has grown from its original 14,000-square-foot building to a 120,000-square-foot facility on Highway 301. The company has remained in the family – a remarkable feat acknowledged by S.C. Commerce Secretary Bobby Hitt at the March 23 celebration – and is now run by Robert Hurst, Jr.
Phoenix makes 10,000 unique parts for 2,000 global customers and its 100 employees turn out between 500,000 to 600,000 parts per day. Its parts are found in many commercial and military jet engines around the world. South Carolina’s aerospace industry cluster accounts for 17,000 private sector jobs with an average total compensation rate of $71,000 per year. Greenville Technical College offers training to provide the necessary workforce through its aircraft maintenance technology program, located at the S.C. Technology and Aviation Center (SCTAC). Students may pursue one of three certificates, an associate’s degree or a bachelor’s degree, in partnership with Embry Riddle Aeronautical University. According to program department head Carl Washburn, students who graduate and earn the FAA certification have strong job placement rates within the industry. The program is limited by the size of the current facility, Washburn said. 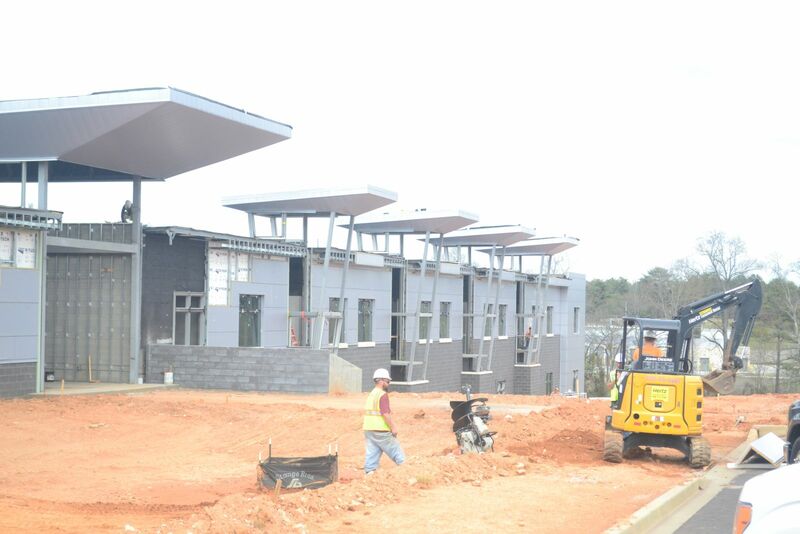 Greenville Tech is constructing a $20-million, 93,808-square-foot, state-of-the-art facility in conjunction with the S.C. National Guard. They plan to move into the new building this summer and begin classes in the fall. The new facility will be three times the size of the current space and will include dedicated lab space, a larger hangar for 12 fixed-wing aircraft, including the 1983 Falcon 10 Dassault aircraft donated by Spinx Inc., and one helicopter, and will allow the program to grow and increase the number of students able to complete the program and enter South Carolina’s growing aerospace workforce. This aircraft maintenance technology program is licensed by the Federal Aviation Administration. Certificates are available for airframe, powerplant and avionics, and each takes 18 months to complete. The two-year associate’s degree program requires 2,000 contact hours, including 1,000 hours in lab or classroom work and 1,000 hours of working on airplanes. Students work on every part of the aircraft, including the engine, landing gear and hydraulics, said Washburn. The experience is similar to the work being done nearby at Honeywell and Lockheed Martin. Boeing plans to partner with Norwegian company Norsk Titanium to produce additive titanium parts for the 787 Dreamliner. The 787 uses more titanium than similar planes given the carbon-fiber fuselage and wings, therefore using 3D printing, to make the parts would save Boeing an estimated $2 to $3 billion on each plane. Boeing designed the components and both companies collaborated during the development process. The FAA certification process was completed in February of this year and officials expect the required permits to be in place soon. Manufacturing is set to begin in Europe by the end of this year and will eventually move to Plattsburgh, New York. Dallas-based American Airlines announced this week that it will add three non-stop flights from Greenville-Spartanburg International Airport to Chicago’s O’Hare International Airport. The flights will depart GSP at 8:10 a.m., 10:05 a.m. and 6:20 p.m. each day beginning July 5. The addition of these three flights brings the number of daily departures from GSP to approximately 50, said Rosylin Westin, vice president of communications and community relations at GSP. Greenville-based ACL Airshop has unveiled ambitious plans to double the number of container stations it runs around the world. The plan calls for increasing from 37 stations today to approximately 75 within the next five to seven years, including ten repair stations. ACL plans to add five new stations this year to jumpstart the growth, in addition to adding repair station capabilities to its operations in Hong Kong and Bogota. According to Steve Townes, president & CEO of partner firm Ranger Aerospace, the company will build a new headquarters and factory location in the Greenville area, move to newer facilities at JFK and consolidate facilities in Amsterdam. Stevens Aviation announced the signing of its first Garmin G5000 system installation for Beechjet at its Greenville facility March 13th. This installation of the new integrated flight deck updates the front office of the Beechjet with state-of-the-art touchscreen controls, LCD displays, ADS-B out compliance and has an estimated 250-pound weight savings. Stevens aviation operates three facilities in the U.S., including its Greenville operation, and has more than 60 years of experience providing civilian MRO services for Beechcraft, Challenger, Cessna, Embraer, Gulfstream, Learjet, Piaggio and Pilatus aircraft.